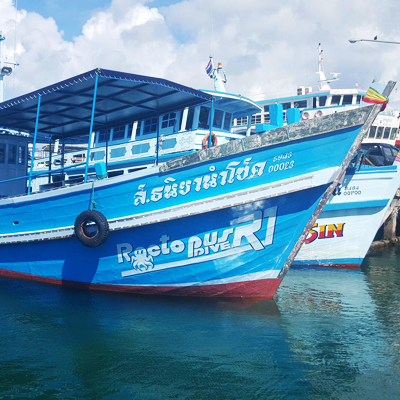 R1 – 30metre vessel customer modified for diving. 50 person max capacity. Sundeck, Canopied dive deck with table seating, toilet and designated smoking area. 2 water entry locations and 2 re-entry ladders. R2 – 25metre vessel customer modified for diving. 40 person max capacity. Sundeck, Canopied dive deck with table seating, toilet and designated smoking area. 2 water entry locations and 2 re-entry ladders. R3 – 10 metre speedboat. Registered for 16 persons. Full length sun canopy and seating. R3 primarily acts as out Freediving boat. 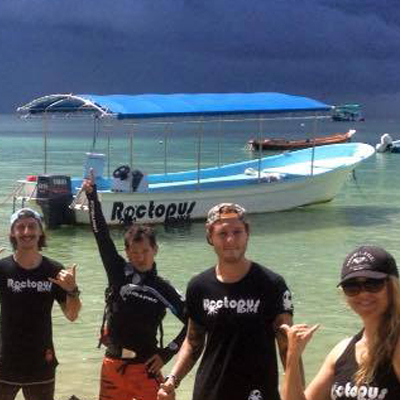 It is also available for snorkelling trips, island tours, and private dive charters. 15metre swimming pool with custom designed deep area (3 metre) for deep confined training. 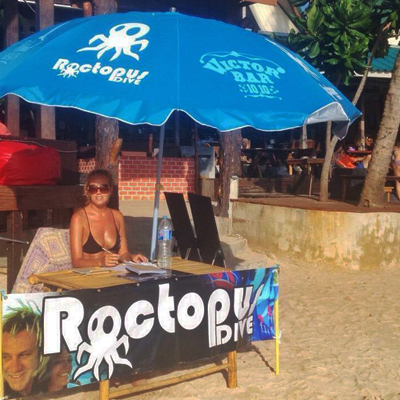 Relaxing sun loungers surround the pool of which all customers may use during there stay with Roctopus Dive. 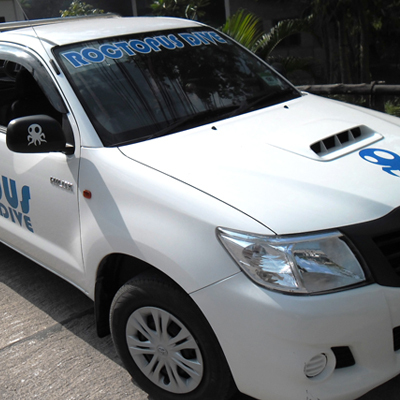 Our Taxi transports divers to and from the shop as well as booked customers from the pier*. 14 Persons capacity. 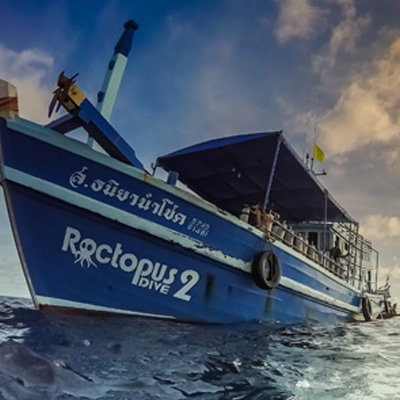 *please note we do not pick up customers from their accommodation for diving. Stocking the latest range of Aqualung, Tusa & IST equipment. Catalogues of the major dive suppliers are in store and all products can be ordered via the front desk. 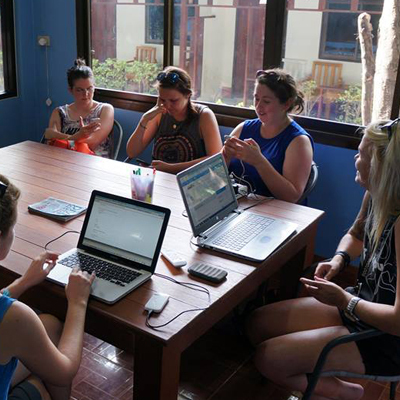 Our beach shack is the central hub for all beach activities. We have 8 Stand Up Paddleboards (SUP) as well as 4 kayaks and can arrange boat trips around the island. With custom built furniture and 40” Flat screens for teaching purposes. Custom built to house over 60 full sets of equipment. As an Aqualung partner centre we provide customers with AQL Wave BCD, AQL Calypso regulators, AQL Flexar Fins, 3mm Shorty Wetsuits and AQL Look masks. 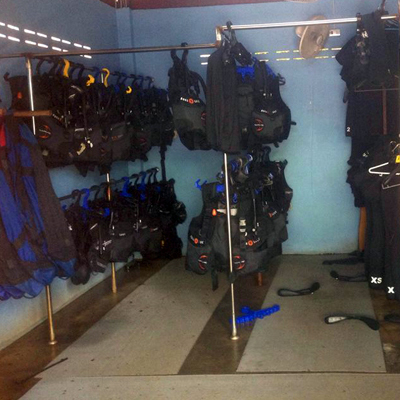 *customers with personal dive gear may store their equipment in our shed where it may be hung , dried and stored safely. Custom built equipment wash and maintenance area. As well as drying racks. 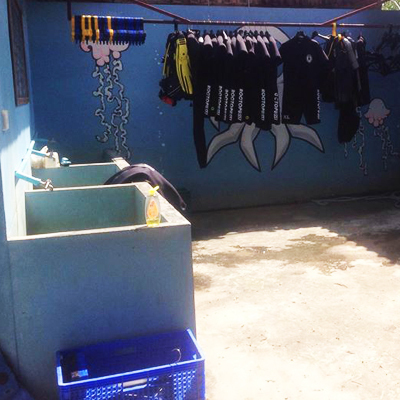 We have separate washing tubs for Regs, Bcs, Fins, Masks & Wetsuits. 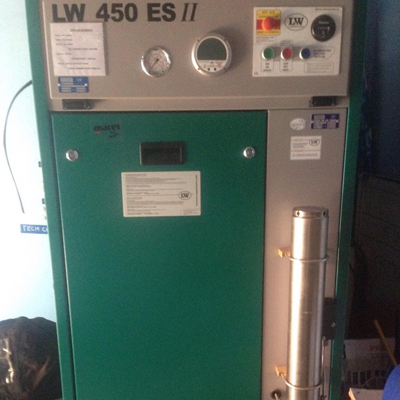 Custom built to house a brand new L&W 450L silent, “pure air” compressor. 100 brand new Luxor tanks. 8 Fill Whips. The room also houses a full service centre where we maintain and repair equipment by a fully certified equipment technician. 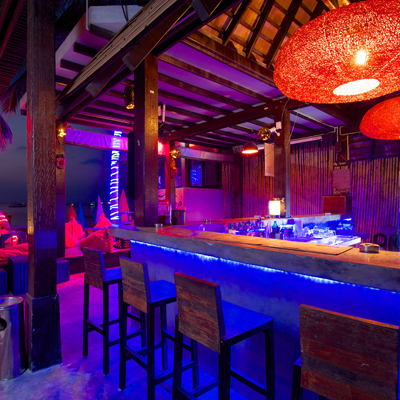 Our dive bar, situated overlooking the beach and adjoined to the swimming pool. 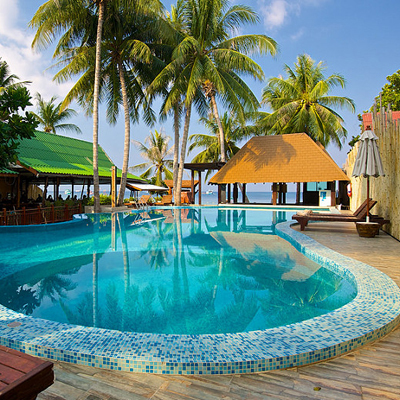 West facing, perfect to catch the infamous Koh Tao sunset. The bar sells a range of beers/wines and spirits and has bean bag seating areas as well as a pool table. 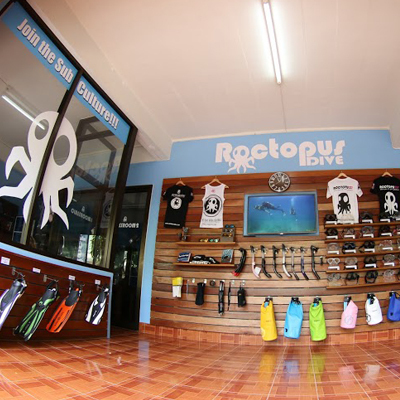 Roctopus Dive is one of the few dive companies on the island to have a specific, separate building dedicated to the training of Dive professionals. 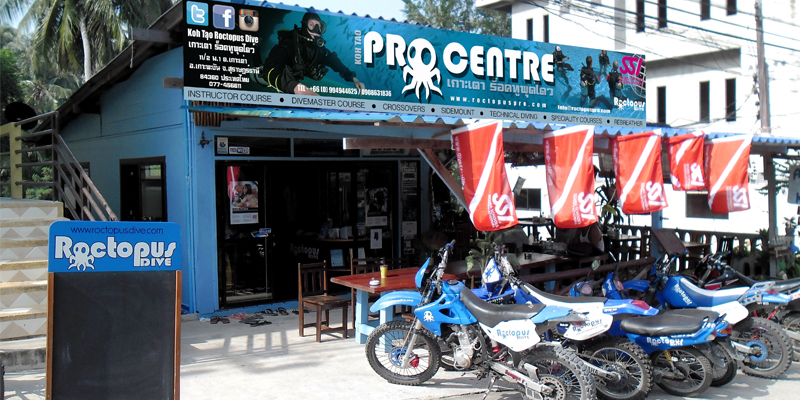 Our Pro centre is located just 5 mins walk away from our main dive shop, and is setting a new level of excellence on Koh Tao.